What would the media do without property? Put all the hype aside. Humans are mammals and we share the same needs and wants being; fresh air, clean water, readily available food, adequate shelter and the desire to mate. Everyone can have an opinion about property, just remember shelter is essential. Ok, we need shelter, and picked a location. What do we pay? Whatever we can! Property is priced by the market which is a factor of wages, savings and borrowing power (determined by bank regs and interest rates), also underpinned by rental yield which in turn is a factor of wages (determine rent) and deposit interest rates (set comparative yields). So what does this mean? Simply, the Government more or less controls property cycles (directly and indirectly) and tells us if we can buy or forces us to rent. Property consists of 2 elements. Land and Improvements. Land and rezoning opportunities are scarce, limited supply. Increasing population and traffic means distance from point A to B will still be 5km, but the travel time keeps extending. Metro trains, light rail and new roads - it's all too little too late and will likely be inadequate upon completion. Prime real estate becomes even more wanted as each metre feels further and further away. Improvements - materials, labour and paper shuffling. Cost associated with paper shuffling is now greater than the construction cost 25 years ago. Regulations and rules require reports which require qualified consultants which requires money. More reports means more time and energy to assess, councils costs also increase. Labour - well we know governments around the world focus monetary and fiscal policy on growth targets, which means wage increases. The cost of labour also influences the cost of materials as they need to be manufactured and transported. Construction costs continually get more expensive. So the next time you read you read an article ask yourself; Is my job at risk? Are wages going to fall? Has new land been discovered in Sydney? Have planning controls eased up? Is the population shrinking? As these are factors which really cause property prices to decline. 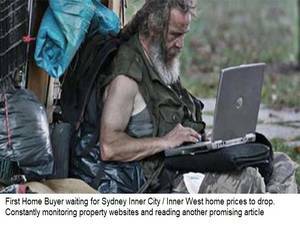 Word of advise for 1st home buyers; next time you read an article about Sydney property prices think about what's really happening and any slight feeling of joy should quickly be overcome by "sh**, how much is my rent going to go up by..."